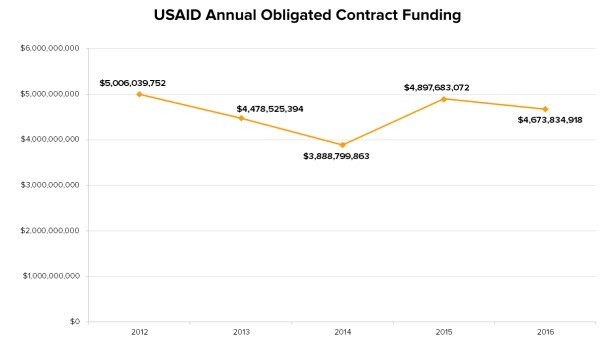 The United States Agency for International Development obligated contract funding reached $4.68 billion in 2016, decreasing by $200 million from the previous year. The modest decline for 2016 follows a $1 billion surge for contract spending from 2014 to 2015. Chemonics reclaimed its position as the top contractor for USAID in 2016, winning nearly double the contract funding from 2015. 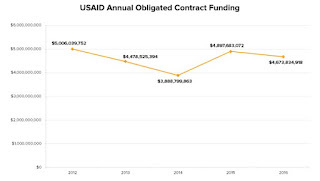 The global development consulting firm garnered over $1 billion worth of USAID financing last year, following the award of a $9.5 billion indefinite delivery, indefinite quantity contract, or IDIQ, in 2015. 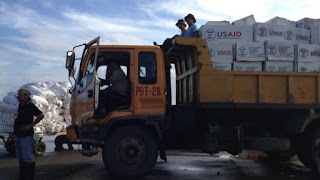 Tetra Tech and DAI, meanwhile, were awarded the second and third-highest USAID contract funding, respectively, combining for over $800 million in obligated funding. Together, these top three recipients comprise 39 percent of all USAID obligated contract funding in 2016. Five organizations managed to break into the top 20 awardees in 2016. Remote Medicine, which won $10 million in contracts in 2015, received $67 million last year. International Business & Technical Consultants doubled their contract funding from $21 million in 2015 to $42 million. Nathan Associates received $40 million — up by $11 million from the previous year. Two of the list’s new entrants ranked within the top 10 organizations, each obtaining over $100 million more than their previous contract funding. Creative Associates International, which received $43 million in 2015, attracted $146 million last year. Similarly, the Kenya Medical Supplies Authority received $122 million in 2016 versus $17 million in 2015, as it secured a five-year contract to procure, warehouse and distribute drugs and medical equipment for public hospitals across Kenya. KEMSA is the only non-U.S. organization to make it into the top 20.